In July 2013, 1600 members of the Kitenden Corridor Conservation Area (of the larger Olgulului/Olalarashi Group Ranch (OOGR) located on the Tanzanian border of Kenya) leased 16,000 acres of land to the International Fund for Animal Welfare (AFAW). 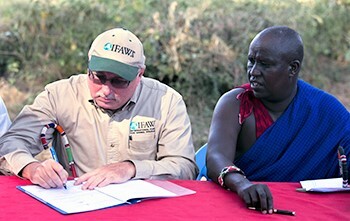 The signing ceremony between Azzedine Downes, IFAW President (left) and Mr. Daniel Leturesh, representing the Masai community, happened in a ceremony held in one of the world’s most spectacular sites, Kilimanjaro, the highest, freestanding mountain in Africa. 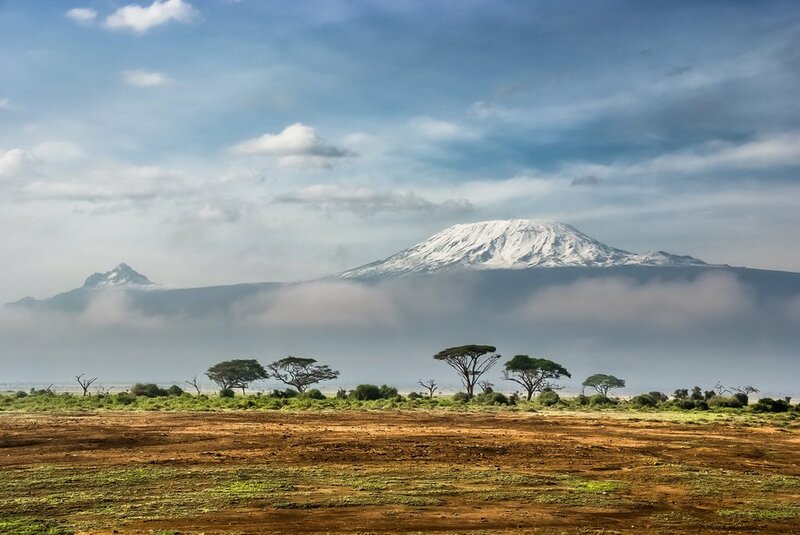 Mount Kilimanjaro stands in Tanzania, but just across the border from Kenya and Amboseli National Park. home in 2013 to 1,400 elephants and countless other wildlife species including lion, cheetah, leopard, buffalo, wildebeest, antelope, giraffe and an array of birds. The dual visions of Amboseli and Kilimanjaro helped to define the spectacular vision of Africa, as another precious vision was in a state of genesis. The goal of this historic signing ceremony and lease was to insure that the land would be maintained as a critical corridor and dispersal area for elephants and other wildlife. The signing turned Kitenden into a fully-fledged community-owned wildlife conservancy for use by Amboseli elephants and other wildlife, while improvingmthe welfare and livelihoods of its members through eco-tourism activities in the area. We’re learning about this vital conservation project because I decided to check up on an American woman who inspires me greatly — Faye Cuevas, Esq. aka Lieutenant Colonel Faye Cuevas. Chief of Staff and Senior Vice President for the International Fund for Animal Welfare, the organization behind this ambitious conservation effort. Faye and her family could live in Washington, DC, but they do not. After conferring with her three young children, the quartet was ready for an the purposeful adventure of a lifetime. This US military counterrorism expert is at the top of the pyramid of experts working with the Kenyan government to hunt down big game poachers, and especially elephant poachers. We share a 2-minute video, a mere slice of the almost 10-minute PBS interview with Faye in Africa. Broadcast shortly after US president Trump reversed America’s ban on tropy hunting. Stunned by a deafening public outcry, Trump put the skids at least temporarily on his big idea to start killing big game again, presumably because his sons were eager to make front page news with big kills. Between his kids and the NRA, Trump never met an assault rifle that he didn’t want to hug. Follow this link to watch the entire PBS episode, giving you the best interviews with Faye Cuevas I’ve seen. This woman is inspirational magic for our young people. In our 2-minute short below, Faye dons traditional Maasai dress and sits down with the women, who are clamoring to have more women represented in conservation efforts. The result is the actual article that got my attention in a last 30-days search on Faye. Watch the video and them meet Team Lioness. 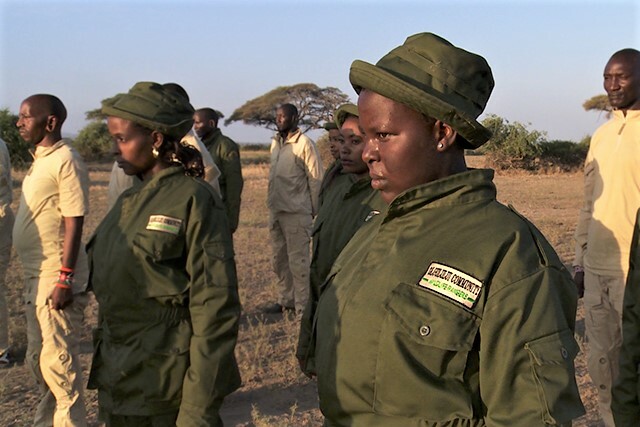 One of Kenya’s first all-female ranger units, team Lioness protects 150,000 acres of community lands shared by both people and wildlife. The presence of team Lioness has created a demand in some Maasai communities for more female leadership in conservation initiatives and calls for additional female rangers. AOC has shared a lot of information in this blog post — lots of organizations and information about big game conservation on the Kenya-Tanzania border. TenBoma is Faye’s top level organization, developed alongside East Africa Regional Director James Isiche, as a system of integrated networks involving local and global communities united with one goal: to predict and prevent a poacher's next strike. Both Cuevas and Isiche speak to these community initiatives in the PBS videos, and they span out across Kenya. Today we are in one TenToma place in southern Kenya.